Kythnos passenger and car ferry ticket prices, timetables, ticket reservations and information for ferries sailing from Kythnos to Milos, Serifos, Sifnos, Lavrion and Piraeus. Compare all available Kythnos ferry ticket prices in real time and book the cheapest available Kythnos car and passenger ferry tickets sailing to and from Kythnos, Milos, Serifos, Sifnos, Lavrion and Piraeus with ANEK or Blue Star Ferry Line ferries online with instant confirmation. Book Kythnos Ferry Tickets with ANEK or Blue Star Ferry Line for ferries sailing from Kythnos to Milos, Serifos, Sifnos, Lavrion and Piraeus online in advance to enjoy the cheapest available ferry ticket price. The price you see is the price you pay. There are no hidden extras or surprises such as added fuel surcharges or booking fees and we do not charge you anything extra for paying with a Visa Electron card. The price we quote you for your selected Kythnos passenger or car ferry ticket, onboard accommodation and vehicle type is all you will pay, and that's a promise. To obtain a Kythnos ferry ticket price and book your ferry ticket securely online please use the real time ferry booking form on the left. You are also able to add a hotel at your destination, or anywhere else, to your ferry ticket when completing your ferry ticket reservation. Kythnos (Thermia) is a fairly small Greek holiday Island located in the Western Cyclades and a good choice to visit if out Island Hopping. There is no airport on the island however travellers have a quite good ferry service available from Pireaus - both superfasts and normal car ferries. The nearest island neighbours of Serifos and Kea are only a quick ferry ride away - with Sifnos, Syros, Kimolos and Milos all fairly close as well making some or all of them perfect for a quite compact island hopping holiday. Remember that you cannot buy your ticket when you get on a Greek Ferry so should book online in advance. Also note that the superfast ferries can be very booked up especially on Fridays and Sundays. There is a small information booth just along from the quay in the port - though it's opening times are somewhat variable. Kythnos is also known locally as Thermia - at one time Loutra was a very popular destination for people wishing to use the spa and hot springs located there. The gateway airport is Athens. For Kea head south to nearby Milos, Serifos, Sifnos, Lavrion – it is not served from Piraeus; take the bus or hire your car, drive to Milos, Serifos, Sifnos, Lavrion, drive on to the ferry and off at the first stop, Kea. For Kythnos there are ferries from both Milos, Serifos, Sifnos, Lavrion and Piraeus. For Serifos and Sifnos there are fast ferries from Piraeus. Kythnos is an island for relaxing, so bring good books and snorkelling gear. You can also visit the warm baths in Loutra and even get a massage. Loutra ("Baths")is a small village where there are hot wells, reputed for their healing waters since antiquity. Chora is the island's capital, and is a picturesque village in medieval style. Here, you can visit the Church of Trinity. Driopis is also a very pretty village, with typically winding streets and laid-back atmosphere. There is a small folklore museum here. In Kanala there is a small church dedicated to the Virgin Mary, with icons of healing powers. In Kythnos there are a few good beaches here that you can either walk or take the boat to. Episkopi and Apokroussi are very nice, but you can also stay in the harbour Merichas if you want. There are a couple of bars on the island, and you'll find them in Chora, Loutra and Merichas. Their atmosphere is laid-back and friendly. The younger audience usually prefer Merichas. You'll find some taverns in Chora and Merichas. The Kopanisti cheese is made on the island and worth a try. There are also a few places to eat in Kanala, Driopis and Episkopi. In Chora there are a few shops that sell handpainted textiles in beautiful colours, leather and wood objects as well as ceramics. You can also buy strangely formed shells - a nice thing to decorate your bathroom with. Best Price Guarantee - We always offer you our lowest available ANEK or Blue Star Ferry Line passenger and car ferries ticket price to and from Kythnos. There are no hidden extras or surprises such as added fuel surcharges or booking fees and we also we do not charge you anything extra for paying with a Visa Electron card. The price we quote for your selected Kythnos ferry ticket, onboard accommodation and vehicle type is all you will pay, and that's a promise! In the unlikely event you find the same all inclusive Kythnos ferry ticket cheaper in the brochure of any other tour operator we promise that we will do our best to beat that price or offer you the choice of requesting a refund. 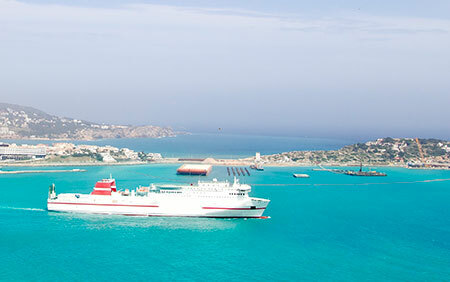 To book Kythnos car and passenger ferry tickets please click here. At ferryto.com you are able to obtain live Kythnos ferry ticket prices, check availability and book car and passenger ferry tickets to and from Kythnos at our lowest available ticket price. Ferryto.com is part of the world's largest online ferry ticket distribution network providing the ability to book over 80 major European ferry operators including to Kythnos and to over 1,200 other ferry routes throughout the UK, France, Spain, Ireland, Holland, Eastern Europe, the Mediterranean, the Baltic and North Africa.